1.Adopting new 3-8 grey level G4(Ricoh) all stainless steel internal heating industrial micro piezo print head, the ignition frequency is 30KHz, variable ink droplet printing (7pl-35pl), can easily print high resolution images of 600*1200 dpi. Ricoh G4 print head is anti-corrosive and long lifetime, working performance is stable, what’s more, it is cost effective and suitable for long-time working, 24 hours running. If maintain in good condition, the life time of print head can reach about 5 years! 3.Emergency back-up power supply, when the power is turned off suddenly, the printer can still maintain the normal operation of negative pressure system, and it will be engaged in work quickly once the power is turned on. The 24 hours*7 days production can be achieved. 4.The cartridge constant temperature system, keep the ink viscosity be consistent with different environment temperature. 5.Automatic measure the thickness of media, which eliminate the procedure that we measure thickness by ourselves.Ensuring the correct print height, What's more, it saves our time and improves our work efficiency. 6.The stable negative pressure system can ensures the printer to supply ink smoothly in the production process, It also achieves long time ink supply. 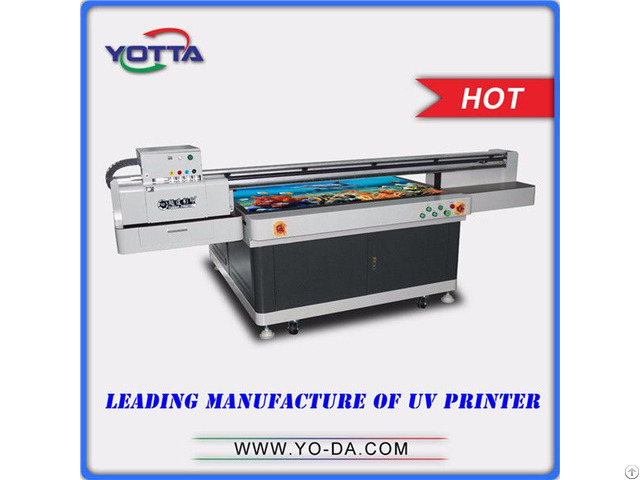 7.You can choose unidirectional and bidirectional print mode according to the demands of production. 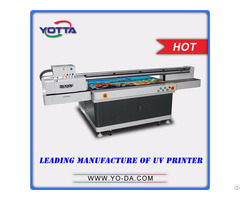 8.YD1510-RA UV flatbed printer adopts Ricoh G4 print head can print UV white ink or UV transparent varnish, so that can meet customers’needs of 3D、embossed、highlight effect and other special effect. 9.Professional channel control technology can achieve the control of each channel, providing the technical assurance. 10. Providing strong、comprehensive hardware testing and tuning function, for example:printhead rotating table, position calibration and voltage regulation for the printhead, bidirectional printing calibration, step calibration. 11.The frame of work table adopts square tube welding tempering heat treatment, processing the whole side and upper surface, the guide rail Y axis and ball screw were installed in the frame side, reducing the size of the equipment, with the whole process for the installation surface of the suction platform, to ensure the accuracy of the platform, and doing the aging treatment(Under the natural condition for 30 days, until the steel structure deformed naturally, then finish machining). So that can ensure that the platform and frame will not deformed for a long time, Prolong the service life and precision of the equipment.